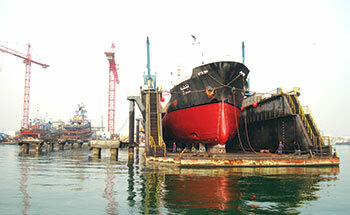 A trusted name for over half a century, Basrec has pioneered the ship repair and engineering industry since 1962. It was the first of its kind in the kingdom able to cater for large scale vessels needed for offshore oil operations and ocean-going ships. Located at Mina Salman Port, Bahrain Ship Repairing and Engineering Company – Basrec was incorporated with limited liability by charter of The Late Amir Shaikh Isa bin Salman Al Khalifa on February 24, 1962. It was the vision of Yusuf bin Ahmed Kanoo and Ahmed Ali Kanoo that paved the way for this significant achievement. With the considerable expansion of offshore oil operations in the Gulf, Yusuf bin Ahmed Kanoo and Ahmed Ali Kanoo saw a clear requirement for a modern equipped ship repair installation, able to carry out work on vessels of up to 1000 tonnes, and carry out emergency maintenance on the larger ocean going ships that traded in the surrounding waters. The late Ahmed Ali Kanoo believed that Bahrain’s central location made it an ideal place in which to establish Basrec. Consultants were invited from London to Bahrain to prepare a comprehensive report on local market conditions, who recommended a two slipway installation. Following approval from The Late Amir, tenders were invited for its construction. Meanwhile, Yusuf bin Ahmed Kanoo established a Bahraini share holding company for the purpose of undertaking ship repair work in Bahrain and invited Bahraini Nationals to participate with 49 per cent of total company shares offered. Following an overwhelming number of applicants, Ahmed Ali Kanoo approached the government for the nomination of a committee, which was approved and formed on April 14, 1962 - to supervise and decide the method of allotment of shares to the Bahraini public. This decision saw the Late Ahmed Ali Kanoo pioneer the concept of public share holding companies and he was elected chairman of Basrec in 1962. Built on an artificial island, the shipyard takes advantage of the depth of water in a natural deep water pool. Construction included the formation of an access causeway 800 feet long linking the island with the industrial area, which was subsequently created. Basrec was designed to cater for Gulf based tugs which previously had to voyage to Bombay or Karachi for routine dry-docking - a voyage time of 14 days. In the years that followed, Basrec’s activities increased and diversified. A notable operation, considered a large undertaking at the time was on a Japanese tanker Yoho Maru, which involved the cutting away of 121 feet x 37 feet of damaged hull structure, and the design production and installation of prefabricated sections to provide temporary protection for the vessel until it returned to its home port. Oil exploration in the region was a major catalyst for Basrec’s significant growth; however the establishment of the raw fishing industry provided an unexpected source of ship repair work. At the beginning, Basrec could accommodate a single vessel of up to 220 ft in length or several vessels of similar total length, and a displacement of 1000 tonnes. The deep water repair jetty was 380ft in length with access bridges at each end, and a 15-ton capacity tower crane with an under hook height of over 100 ft and jib radius length of 164ft was centrally positioned between the twin slipways. In 1974, Basrec awarded a contract to George Wimpey and Company for the construction of a new 262 ft long jetty, which was built along the south side of the shipyard and served by the tower crane. Basrec also implemented plans for the extension of the workshop and offices, designed to provide additional space for the installation of new machinery to cope with an ever-increasing workload. Original plans of Basrec facilities incorporated the decision that it would remain at the forefront of the industry and offer comprehensive services to ship owners. The island location of Basrec’s premises proved to be an extremely efficient layout, capable of being readily expanded to meet increased demands. Considerable expansion has taken place in the last 10 to 15 years. 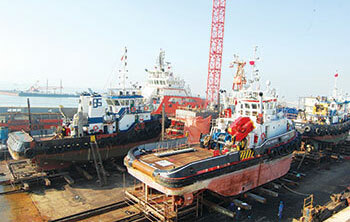 Though the core business has been and remains ship repairing and allied engineering services for commercial and naval ships, Basrec is also engaged in the repair of small boats, inspection and repair of containers as well as service and repair of marine and industrial pumps through its subsidiary. In recent years, due to the industry’s challenging economic climate, Basrec has placed renewed focus on operational efficiency, and put business processes under review in 2016 to maintain its competitive edge. The achievements of the past 55 years are testament to the fundamental strength of the company and its robust strategy. Going forward – given economic challenges in the industry Basrec will continue to operate with great caution, be more determined to improve cost control, streamline production efficiency, argument risk management and win orders. Additionally, the board of directors and management have set goals to diversify the business within the engineering industry and expand across the region.